As we mentioned earlier, the symbolic force is transmitted through a most wide array of apparatuses. One of the most effective apparatuses is the school system which transmits “knowledge” and “education”. The British invited comments from Bharatiyas in a public debate between 1823 and 1835 centered on what was to be the language and curriculum of schools, which were to be funded by the government. The parties to the debate were the ‘Orientalists’ and ‘Anglicans’. The former group, led by Governor Warren Hastings, proposed that the native forms and content of education such as Sanskrit Schools and Madrassas, be retained. The “Anglicans”, who were ultimately successful, contemptuously dismissed such suggestions and proposed an “education” such that the Hindus would “become more English than Hindus, just as the Roman Provincials became more Roman than Greeks or Italians’. [Trevelyan, brother-in-law of Macaulay] One of the most incredible aspect of the imposition of the Hegemony in Bharat was that the British stated their objectives very clearly from the inception of their programme. schools, Macaulay insisted, would be “Indian in blood and colour, but English in tastes, in opinions, in morals and in intellect.” He neglected to mention that the “Indian blood and colour” would ensure that the Indians could never be “real” British, but a dark imitation. 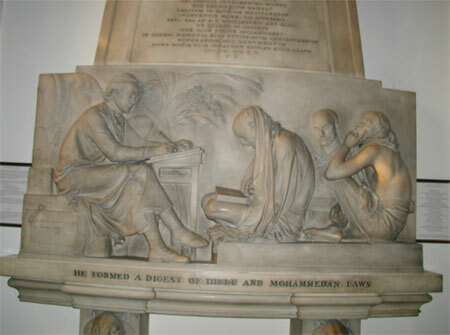 The selected medium of instruction was English, the language of the conquerors, since, as one of the Anglican supporters Grant said, “its acquisition was expected to undermine and subvert the fabric of error that was Hinduism.” According to Macaulay, Sanskrit and Arabic were found lacking for “a single shelf of a good European library was worth the whole native literature of India and Arabia”. The decision was also taken to restrict the Education to the pliant elite who was willing to switch from one master to another. After the initial success of the Anglicans, there was a mad rush to establish English schools in Bharat, The Christian Missionaries took the lead but there were quite a few other Europeans and some Bharatiyas who went into the business of producing “Brown Englishmen”. The Government established Colleges in the three major urban centers of Calcutta, Bombay and Madras. These institutions increased exponentially as, especially the upper class Hindus rushed to be civilized. The pattern for these schools had been established by Thomas Arnold, who became Headmaster of the “Public School” (meaning “private”) ‘Rugby’ in 1828, and whose methods and curriculum were widely admired throughout the Empire. The goal of “Education” according to Arnold was to make a boy into a “Christian, a gentleman and a scholar”; in that order. The methodology of imparting the Education was as important as the substantive knowledge transmitted in the fulfillment of the hegemonic goals. Each school was organized in a rigid hierarchical structure – patterned on the Roman Empire – with the Headmaster as a remote, awesome, Emperor whose wrath was to be feared. In Bharat and the other colonies, this individual would be White, British and male. The teachers were designated as “masters” and the exemplary members of the sixth forms were “prefects” who ensured that woe be to the boys who did not keep a stiff upper lip. Latin and Greek were standard, as much for inculcating discipline – to build character – as for opening the vistas of Greek and Roman philosophy and literature to which, the hegemony convinced everyone, the English had an unbroken link. After all, had not the English become the carriers of the flame of Greek democracy, Bharatiya and other colonial boys exited these institutions waxing nostalgically about “home” – meaning England! They played cricket and lustily belted out “God Save the King” before any public event. In many diverse, subtle, and not so subtle ways, however, they were reminded ever so often that they were not Englishmen and that the top rungs of the ladder were out of their reach. They were trained to keep a stiff upper lip, though. The classificatory power to define what was “knowledge” was crucial in the construction of the hegemony since the rulers could establish a scale of value on all knowledge. This process operated at several levels. Firstly, knowledge would only be transmitted in the language of the hegemon – ensuring that all other concepts from other paradigms had to fit within the Procrustean bed of this paradigm. (for e.g. to understand what a “Procrustean bed” was, one had to have an acquaintance with the English-appropriated Greek Classics.) Secondly, knowledge is to be only transmitted within the approved schools. Even those on the outside, whose learning is given no credence by the hegemon, devalue knowledge obtained outside of the official schools. All accept that only “schools” impart knowledge. The fisherman, farmer, yogi, pandit or weaver is by definition, not knowledgeable and thus inferior. Thirdly, the particular, historical experiences of the hegemon is untethered from its parochial origins and universalized as applicable for all places and all times. For the transmission of knowledge, the hegemon’s curriculum is deemed complete i.e. it is universalized as “Education”. The graduated Bharatiya is taught that he is “Educated”, period, not that he is educated to keep records. The Bible is “Scripture”; “Literature” is English literature. In fact, one of the ironies of the new dispensation was that “English Literature” as a subject was taught for the first time in Bharat – in England, as we mentioned, it was only Latin and Greek. The development of liberal democracy can even lead to an End of History. In each instance, the premises underlying the universalized elements become pervasive as they are applied to local conditions. For instance Hindu Dharma is evaluated as a religion (which it is not) and how well it addresses Christian categories such as one God, one Book, one Founder, Saint, sinner, Devil, demons, heathens, priests and how these relate to each other – sinning, repenting, forgiving, judging, punishing, submitting – to produce results such as salvation or damnation. The establishment of the official schools also served the very important function of convincing the masses that were excluded from the good life that their exclusion was legitimate: they did not have an “Education”! The schools thus provided the poor a “reason” for their poverty and created a huge clamour for an Education. The lambs were paying and pleading to be slaughtered. With the British as the source of all knowledge, Bharatiyas could only sit at their feet and imbibe their wisdom. Knowledge of Bharat was by definition inferior. Their scientific Sanskrit grammar was a fluke, their history was myth and their philosophy was “religious”. Without any point in being creative, people of Bharat thus stressed rote knowledge and scrupulous if not outright plagiarism. Non-creativity became institutionalized and Bharatiya scholars would dare not cite another Bharatiya since the latter were incapable of being innovative and insightful. Bharatiyas only quoted foreigners to sound authoritative. Shri Ravi Dev is the Sanghachalak of Hindu Swamyamsevak Sangh (Guyana). He has been a Hindu activist for the past 27 years in Guyana, after 21 years in New York where he was a corporate executive and a member of the New York Bar.